Planning a neighborhood meet-and-greet, important business event, special brunch or wedding reception? A Champagne Bar is an easy, fun and convenient addition to the regular beer and wine menu selections for any party. It’s also a classy touch at a very affordable price. With a Champagne Bar, you don’t have to use a French champagne that costs $40 or more per bottle. (Save that bottle for another time.) For this bar, you can use a value champagne or sparkling wine but still offer guests a delicious cocktail. The traditional Mimosa or a classic Kir Royal are great cocktail choices, but you can offer your guests a little more variety. Setup is easy—use a banquet table and cover it with a tablecloth. Flowers are always a nice touch too. 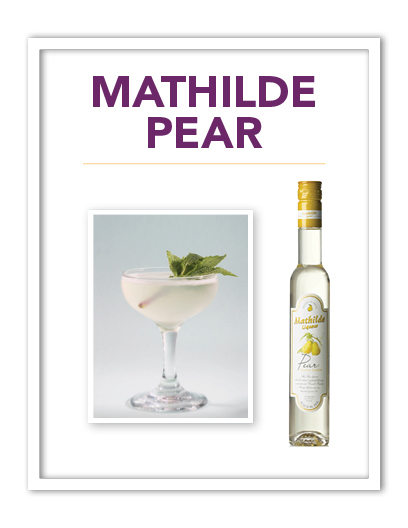 Below are printable recipe cards using the Mathilde Cordials. The cards also include information about each Cordial and its flavor profile. OPTION 1 – Stack multiple cards neatly in front of the juice or cordial to be used. OPTION 2 – Put all of the cards (multiple versions of each) in a punch bowl and have guests draw for their drink. Bonus: The recipe cards can also be taken by guests to create their favorite(s) at home. You should always use glassware for this instead of plastic flutes. Riedel Glassware is the recommended option. Think beyond orange juice and provide your guests with flavorful alternatives like apple, grapefruit, pineapple, mango, peach or a fruit blend. Fresh seasonal fruit can be added to the cocktails or used as garnish, and fresh fruit centerpieces add pop to your table. A bottle of sparkling wine (Toso Brut recommended) should be in an ice bath and kept very cold. Have a few other bottles pre-chilled and ready. The French company Pierre Ferrand offers Mathilde Cordials; a complete line of artisan fruit cordials at a very reasonable price (around $14 each). The flavors include peach, black currant, pear, raspberry and orange. They come in 375 ml bottles and blend perfectly with champagne and sparkling wine. Either from the floral shop or picked from your yard, fresh flowers always add a nice touch to any occasion.